This pattern is available from etsy.com for €5.80. Resi is available in English, German and Dutch! Please go to the respective article. Magic loop, decrease and increase of single crochets, color change, finishing rounds, sewing yarn. With the yarn and hook size mentioned, Honey will be approximately 11 inch (28 cm) tall. 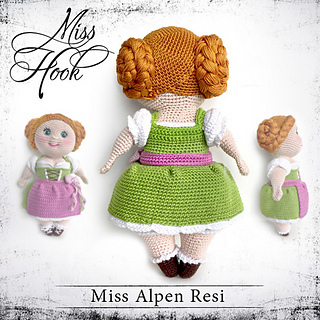 © 2015 Miss Hook // Carla Schwind // All rights reserved. For PERSONAL USE only! The crochet pattern as well as the different parts of the pattern may not be copied, reproduced, published (neither online nor in print), exchanged or sold! The sale of dolls made with this pattern is allowed, but only when these are made by hand in a limited amount by the buyer of the pattern, and marked by a reference to the designer. 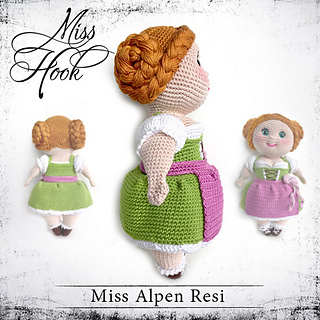 When publishing photographs of the dolls, the designer should also be referred to as „© misshook.de“.